It took producer Firoz Nadiadwala eight years to move on from 2007's Welcome to Welcome Back. But it's going to take him less than a year to make the third film in the Welcome series. The third film is titled Welcome To The Jungle. "It is all-out action film set in the jungles," Nadiadwala explains. "It is set in the army and will feature some of the most complicated stunts ever filmed in a Hindi movie." The action scenes in Welcome To The Jungle would be directed by Nadiadwala himself. He has also directed the hi-tech desert stunts in Welcome Back. The cast of Welcome To The Jungle will be identical to the previous movies, barring Akshay Kumar, who has opted out. 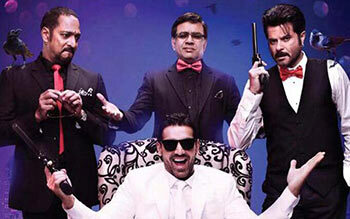 Nana Patekar, Anil Kapoor and John Abraham will play army officers in Welcome To The Jungle. The actresses haven't been cast yet. Mughal-E-Azam, Border, Asoka: Bollywood's EPIC battles? VOTE!